“The Wheel of Time turns and Ages come and go, leaving memories that become legend. Legend fades to myth and even myth is long forgotten when the Age that gave it birth returns again. The Eye of the World, perhaps one of the most epic fantasy novels ever written. Robert Jordan creates a world where his characters come to life, and you alone are immediately immersed into this new fantasy world. As is every traditional fantasy novel, the characters are split into the ‘goodies’, ‘baddies’ and evildoers that wish to conquer the world. The novel begins with three village boys from Two Rivers who find out they are destined to defeat evil. Henceforth, they set out on a heroic quest. Does this sound familiar? The Eye of the World has always been compared with The Lord of the Rings. Robert Jordan has even stated himself that he wanted to bring a familiar essence from Lord of the Rings to his novels. When reading the novel, there are quite a few similarities between the two; especially in the early chapters. The Two Rivers can, without doubt, can be compared to the Shire. Moiraine (the Aes Sedai) verses Gandalf the Grey. I will not judge which novel is better. Both novels are clearly epic and deserve their own amounts of fame. All I can say is that J.R.R. Tolkien certainly inspired a lot of writers. Without doubt, The Eye of the World is the start of a classic epic tale between good and evil. It is an excellent start from Jordan. It definitely sways you on, to read the rest of The Wheel of Time series. The Eye of the World is undeniably one my favourite fantasy novels. 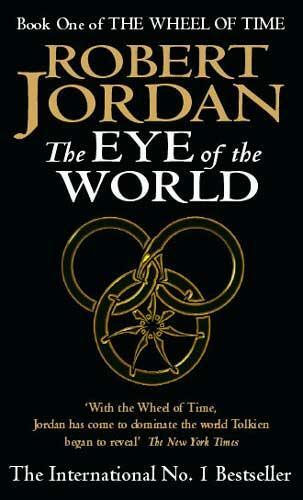 If you are looking to read a novel series, I would definitely recommend The Eye of the World by Robert Jordan. Reblogged this on The Dark Globe.